Everyone's talking about her, everyone's listening to the 16-year-old girl from Jamaica with the hot firecracker voice. She is the first female to challenge the famous lads from Liverpool. She has added a new word to the music vocabulary of teenagers on two continents. 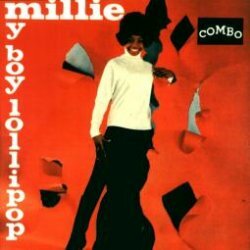 She is MILLIE SMALL, dynamic new singing sensation from the land of sunshine and calypso, who crashed the charts of the world with her bubbling, effervescent voice in 'MY BOY LOLLIPOP'. In Britain, the pretty pixie-faced teenager jolted Beatle fans into a new Ska-mania, when her native Jamaican rhythm started a new dance rage on both sides of the Channel. 'My Boy Lollipop' not only dominated the British hit charts, it started a mass music invasion of sunny Jamaica. The vivacious teenager with the chirping, chuckling voice scored a direct hit in the US too. The platter, released by Smash Records, rocketed the effervescent bundle of talent to national fame and the Number 4 position on the US charts five weeks after its release. 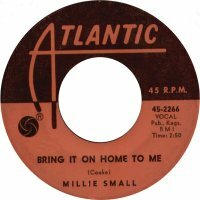 Millie started it all at age 12, when she entered and won a talent contest in Kingston, Jamaica. "When I won the prize money ($50) it seemed like a fortune. I felt I was the richest girl in the world. The following year, when I made my first record (I was 13 then), the disc crashed into the Jamaican Hit Parade and gave me the most wonderful feeling of confidence. You see, when I was 9 years old, I had told my family I was going to be a film star or a singer," says Millie with a throaty giggle. "And you know what, they laughed!" Millie recalls her childhood as though it was way back in the dim and distant past. 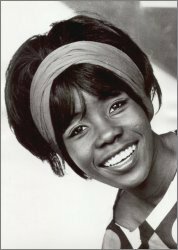 Her parents (Millie's father is a sugar plantation worker in Jamaica), her seven brothers and five sisters, stopped laughing when her first record climbed to the top of the Jamaican charts and she became the most sought-after artist in her native land. That was in 1961. 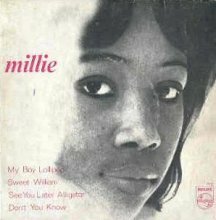 Three years and several hit records later, Millie was an established recording star. Her platters had also been marketed by an independent label in far-away England but, stacked under the wax from Liverpool, they only gathered dust on the shelves of record shops. 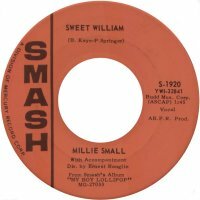 Millie Small, famous record star in Jamaica, was unknown in England. Meanwhile, in London, Chris Blackwell, Jamaican record producer and distributor, was trying to promote the Ska, a Jamaican dance, popular in his native country. Taken from an original revival dance, handed down from generation to generation, it became the rage with Jamaican youth in its modern form. Jamaicans also discarded Calypsos to dance to the music of their ancestors. Blackwell was convinced the Ska, which he called the Blue Beat in London, could start a new dance rage. He released record after record, but nothing happened. Nothing happened, that is, until he decided to journey back home to find Millie Small, the little girl with the big exciting voice. He had a hunch Millie could do the trick and introduce the world to the exciting native rhythm. Would her parents let her go to a strange world? 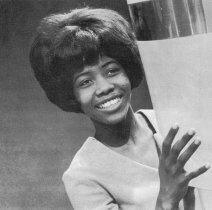 Would a Beatle-loving nation listen to a mere slip of a girl from Jamaica? Chris gambled against the Liverpool odds, and won. In July 1963, with Millie in tow, he boarded a jet for London; a journey that was to spell international fame for the youngster. In Millie's hometown, the sleepy village of Clarendon, where she was born on October 8th 1947, her proud family waited for word of Millie's success in far-away England. "When I was going to Britain, my seven brothers and five sisters went running around the island telling all their friends that their baby sister (I'm the youngest) was going to live in a big house in London and would become a big star," says Millie. "I had to make good, for their sake." Her arrival in London, on a foggy morning in July 1963, went unnoticed by the press or her handful of fans. But Chris prepared to groom Millie for stardom. Now her legal guardian, she was enrolled in England's famous Italia Conti Stage School for speech training and an intensive study of dancing. She learned quickly, for soon she was to start a dance rage on two continents and would sweep across the record charts of the world. Six months later Millie was ready to be introduced to the world. A dub of her voice was brought to the attention of Jack Baverstock, A&R Director of Fontana Records in England. One listen to the refreshing new talent, with the bubbling, Little-girl voice, convinced him. He hurriedly pacted her to an exclusive recording contract. 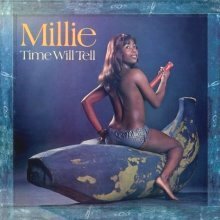 Millie was rushed into a waxing session to cut her first record in England. However, it made only a ripple across the English Channel, leaving Millie and Chris disappointed, but eager to try again. 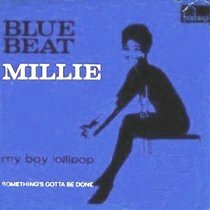 Her next record was the history-making 'My Boy Lollipop'. 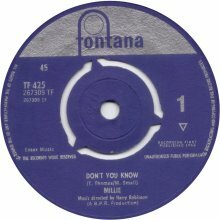 The diminutive 16-year-old with the big smile and ever-shining eyes spread new music excitement across Britannia and went up the British Hit Parade. Music critics hailed her as the greatest singing sensation since the Beatles. "There hasn't been a voice like it since Shirley Temple," headlined the Daily Express. Millie won the hearts of the English press with her naïve reaction to newfound fame. Appearances on radio and national television shows, ballrooms and concert halls made her the most talked-about artist in England. Blue Beat became the fashion in London niteries and the rage of teen circles throughout the European continent. Millie's own reaction to her sudden fame was breathless: "I love making records. And I love it here in England, much better than back home in Jamaica. Coming to Britain was the most thrilling thing I have ever done. I always dreamed of having enough money to buy a big house for my family. Now I can bring them all over here!" Wriggling her shoulders with excitement, she continued: "Now I have a flat of my own in London and I earn more in a week than I earned in a year at home! I haven't been homesick for a single minute, it's been too much fun. I love my new silk stockings and all the pretty clothes I have now. Jamaica has nothing at all like them." Millie's eyes take on a dreamy look when she talks about her manager-guardian Chris Blackwell: "Ooh! He's wonderful. It was my lucky day when I met him!" About her likes and dislikes: "I like everyone and everything, especially boys! I just don't hate or dislike anyone. I love movies and I even love English food. I'm just getting used to it. For months all I could eat was curry. Now I can manage fish and chips, out of paper too! Food is what I miss most about Jamaica. Food and the sun." She admits that there are moments when she misses her brothers and sisters. But, she claims, they are not as adventurous as her. She doubts if they could stand the British dampness and fog, but she hopes one day Mr. Small will give up his position on the plantation and bring his family to the "dream castle" Millie plans to buy for them. Her ambition for the future is to be a jazz singer, but she admits, "It will not be the immediate future. I'm much too young to sing jazz." The most exciting event in her young life was her sensational overnight success in the United States. Manager Blackwell had another hunch about Millie, so he winged his way to Chicago and a talk with Smash Records' chief, Charlie Fach. "When it happed in England, I was sure it would happen in the US," says Chris. Each agreed, and 'My Boy Lollipop' sold over a half-million records within five weeks of its release. Towards the end of July, of this year, Millie arrived in the USA for her first visit. She came directly from an engagement in Germany, where the red carpet was really rolled out for her. As she jetted into Kennedy International Airport, newsmen and press photographers, magazine editors and radio and television crews, were on hand to meet her. They all found themselves laughing and dancing with Millie, in one of the warmest, most unusual receptions ever accorded a foreign recording artist. She was presented with the world's largest lollipop, and it will probably last her the rest of her life. Even the airline got into the act, by naming her flight The Lollipop Special. Murray The K, top kat DJ in New York, of station WINS, was on hand to greet Millie upon her arrival. While screaming fans looked on, he presented her with her huge lollipop, while Port Authority police at the airport restrained the enthusiastic crowd of fans who went wild. At one point, over 30 policemen had to surround Millie when her fans chanted 'Sweet William' (her new hit single) while straining to get through the protective barricade to touch the tiny singer. A hectic schedule of press, radio and television interviews and photo sessions followed. In addition, she went on a shopping tour through Macy's, New York's largest department store, and it was an exciting event in her life to see all the beautiful American clothes and accessories available in this country. A few days later, Millie left the USA scene for Kingston, Jamaica, where she was escorted by police motorcycle, with siren screaming, to the Government Mansion of the Prime Minister. Here she was personally greeted by Prime Minister Sir Alexander Montie, the Governor of Jamaica, and ceremonies usually reserved for royal visitors. Millie's entire family joined her to witness this fabulous Jamaican nationwide greeting for the little girl who rose to international fame from obscurity only a short time before. In the middle of August, Millie again returned to the US for a really special day in her life. 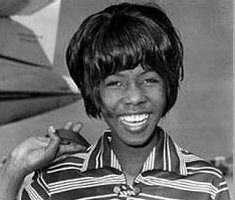 The New York World's Fair had designated August 12th as Millie Small Day at the Fair and she was the center of attraction. A few days later, Millie again left us. It was heartbreaking to see her leave, but engagements in Ireland had to be kept. In the latter part of August, Millie was filmed in England for an Ed Sullivan CBS television program. It was not announced when this filmed sequence will appear on Ed's show, but we hope it will be soon. In September, Millie Small will again return to the US, this time to star in a Murray The K show at a New York theater. Keen teens within the metropolitan area of the city will look forward to this appearance by Millie. Her greatest adventure since coming to England was when she was invited to do a television show with the Beatles. She danced and sang on a London-produced spectacular already shown twice in England, by popular demand. The show is scheduled for a U.S. telecast too. How did she like the Beatles? "They are all very nice boys!" She hastily adds that she is an ardent fan of Peter and Gordon, Elvis Presley and Fats Domino. On boys: "I just started dating when I came to England. At home we have a big lovely dance hall, but my mother would not let me go out alone. I had my first date in England. It was so much fun," she squeals with excitement. "Can it be true?" 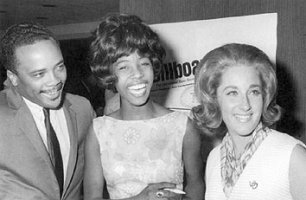 wrote Millie's father of the rumour in Jamaica that Millie would perform at a charity ball in London, at the invitation of the Duke of Edinburgh and princess Alexandra. "It's not only true, Daddy, I learned to curtsy with high-heeled shoes on," she cabled back. Millie Small, the impish little girl, is on her way to a really big career. We wish her the best of success.